There’s no question about it. If you want great results, you’ve got to figure out what works, be sure everyone knows it, and get them to do that too. And yet, most large teams haven’t figured out how to build the sharing of best practices into their cultural DNA. It happens all the time. We ask Joe to share his very best practices with his peers on Tuesday. They love it. The adopt it. Three months later those same peers are playing Joe’s game better than Joe and he’s slid down a few notches on the stack rank which impacts his bonus and his pride. Joe wonders why he didn’t just keep quiet. Stack ranked performance management systems often create behind-the-scenes pressure to hoard ideas. When communication breaks down, the biggest culprit is often siloed organizational structures and competing departmental goals. For them to win, you feel like somehow you lose. Or you’ve got departments that are separated by physical or political boundaries that stifle communication. It’s awkward at best to share best practices if you’ve not been asked. Far easier to just keep doing your thing. 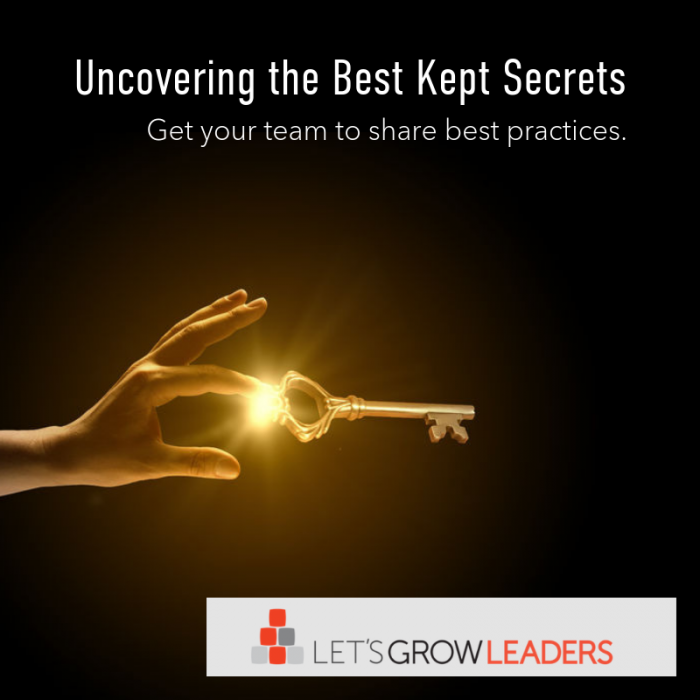 So, how do you uncover the best-kept secrets, despite these challenges? You’ve hired from the outside for a reason, so what are you doing to tap into the best practices of your new hire’s former company? Set the expectation on day one that you’re going to be asking them to share best practices, so they’ll have time to really think this through. Then after they’ve had a month or so to settle in, carve out some one-on-one time to mine for best practices. How did they approach (insert your biggest challenge here) at your previous company? What does XYZ company do better than we do? What tools or processes do you miss from your old company? If you could teach everyone here one best practice from your previous job what would that be? Conclude the meeting by thanking them for all they shared now, and reinforce the expectation that best practice sharing is an important part of everyone’s job around here and that you look forward to more great ideas in the months and years to come. We’re totally in love with this best practice shared by Michael Schrage in his HBR article. Execs built a simple, yet highly effective recognition program that rewarded both the sharer and the person who leveraged the idea. The design was simple, clever and cheap: top management would recognize and reward people who demonstrated an ability to cross-functionally get real value from their colleagues and cohorts. We created two complementary yet competitive awards: “Thief of the Month” — a modest prize and high-profile internal acknowledgement for teams and small groups who “stole” an idea or innovation from another unit and successfully incorporated it into their own business; and “We Wuz Robbed” — a comparably modest prize and recognition for having one’s group’s best practice or process adopted by another internal group. The side effect was that people were going out of their way to identify their best practices and share with others. Instead of being accused of “stealing an idea” they were rewarded for it. Brilliant. We almost always start off our training programs with some sort of “wisdom exchange” on the topic, to identify the best practices of the folks in the room. It’s always fun to see the excitement and responsiveness to these ideas coming from people they work with every day. We hear “I didn’t know you did that,” or “Wow, that’s a great idea!” They’ve already learned something before we even start the training. Of course, you can easily do that too. Why not carve out 30 minutes at your staff meeting once a month where everyone is required to come with one best practice to share with the rest of the team? Be clear that the expectation is that everyone must share. You’ll then have your team actively looking for the very best that people are doing, which can’t hurt morale, and it gives everyone on your team permission to “brag” without looking braggy, since it’s a requirement. 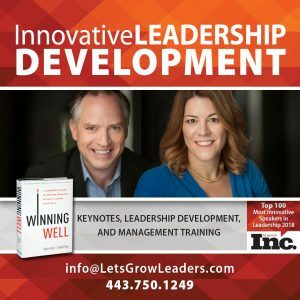 When you hear a great idea, you can also talk as a team about how they’re going to try it between now and the next meeting, and you can open the next session by asking who tried it and how it went. If you’ve got a large, geographically dispersed team, your best bet may be technology. Of course, just buying it isn’t enough. There are lots of dusty knowledge management systems around. Try some focused, time-bound campaigns. For example, we’re currently working with 200 employees in a company located in five countries. We trained them in our Own the U.G.L.Y. methodology to identify the strategic opportunities for their teams. We’re collecting their responses through an online system to easily identify the most important priorities and foster collaboration and best practice sharing. What Are YOUR Best Practices for Sharing Best Practices? Speaking of online sharing, let’s help one another. Leave a comment and share: What would you add to this list? Posted in Communication and tagged best practices, knowledge sharing. In Call Centers what I have found to work best is to put one person on the keyboard and the other person talking. Who knows what jumps up really fast and they both help each other with no one losing status. Plus they have a lot of fun with each other! Tom, I love it! Sounds like a great best practice. Thanks for sharing. 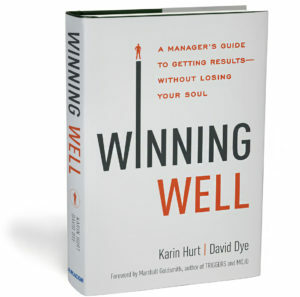 Karin – Great points! To further #3 – we had a large national sales force >100 people and would have the typical monthly calls focused on products or services. I began recruiting 1-3 sales reps or managers each month to speak on the their “in the field” successes on the topic of the month. These were publicized in advance and created more interest and dialogue on our monthly calls. We took it a step farther at our annual sales meeting setting up two half-days with 45 minute training sessions. 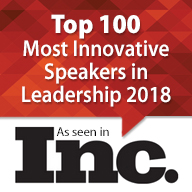 Half of these sessions were led by local sales leaders, not the corporate teams. Sales teams are quicker to respond to someone who is facing the same challenges every day – so we all benefit from using their experience to accelerate learning and best practices. Trip, Thanks so much for sharing! I love both of these ideas. It’s really cool how you publicized the topics in advance to inspire interest. Having led a large sales organization at Verizon I TOTALLY agree with you. 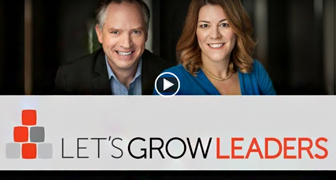 Salespeople want to learn from other successful salespeople. Thanks for sharing your best practices with our LGL community.